Many of the outdoor spaces on campus are available for use by the university and the general public. 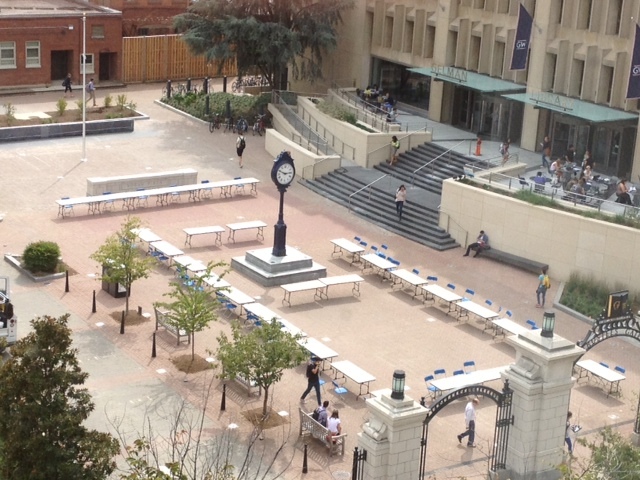 These spaces include: University Yard, Potomac Square, Kogan Plaza, Anniversary Park, Outdoor Table Space, Outdoor Meeting/Classroom Space, Square 80 and G Street Park. These spaces have varying dimensions and features. Power and lighting may not be available in all outdoor locations, so please contact the Events & Venues team to find the best space for your specific needs. Kogan Plaza, a popular gathering place for students, is situated across from the Marvin Center and adjacent to the Gelman Library. The space can accommodate multiple set up options such as fair-style, as shown in the photo. Located on H Street NW between 20th and 21st Streets NW, University Yard is the largest outdoor event space on GW's campus. Tucked away on F Street NW between 21st and 22nd Streets NW, Anniversary Park is sanctuary from the hustle and bustle of city life with a garden, benches and grills for BBQs. A recent addition to the GW campus, Square 80 is a sustainable park complete with trellised seating, a solar panel and an activity lawn. Located at 22nd and G Streets NW, G Street Park is an open air space that is perfect for BBQs and small outdoor gatherings.